One of the most ancient religious festivals in Sicily and in Italy (first played probably during the 15th Century), the longest procession in the country (it runs for about 24 hours), one of the most sensational spiritual events in Europe (composed of 20 ancient and precious sculptural groups carried around the city): the Misteri procession in Trapani is an extraordinary evidence of the religious vocation of the island, as well as an incredibly heartfelt day, perfect to discover the most intimate and spiritual side of Sicily. If you want to attend the event book one of our villas in Trapani or a villas in Sicily for children. 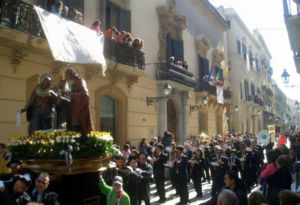 Between the late Middle Ages and the early Renaissance, the cult of the Holy Week spread widely all over Europe: the “Passion plays” were particularly appreciated and eventually, as it had already happened in Spain, the Passion of Jesus started being celebrated and narrated through finely-crafted sculptural groups in Sicily as well. “Misteri” (“Mysteries”) is the name of these groups in Trapani, referring to the mystery of Christ and, probably, to the Sicilian word “misteri”, meaning “profession”, “craft”. All statues are placed upon a wooden structure (“vara”); statues are generally made of silver with golden and coral decorations. The Brotherhood of San Michele was initially in charge of realising the Misteri as well as of providing the workforce to carry them around the city; nowadays the Brotherhood no longer exists, and members of ancient “Maestranze” (arts and crafts) are trusted with the demanding task of organising the whole event as well as carrying the “vare” around the city. The whole citizenry, all the authorities and a shocking number of visitors from all over the island, Italy and beyond attend to this moving celebration. An extraordinary display of lights, colours, works of art telling the story of the Passion and Death of Jesus Christ; a marvellous show of sounds with local bands playing folkloric tunes, followed by the traditional and peculiar “annacata”, a movement performed by the “massari” (those who carry the “vare”) that makes the statues sway… And a never-ending parade that winds through the elegant and refined streets of the city centre, starting on Good Friday at 2 pm from the Chiesa del Purgatorio and then going on all night, without any break or hesitation, until Saturday at 2 pm, in the very same place where it began. The statues, all covered in flowers and dressed with prestigious clothes, are also provided with an effective and sensational lighting system, which makes the parade even more touching. Night and dawn are the most enchanting moments of this amazing celebration: the procession goes through the city centre, and the shadows of the 20 works of art stand out on the walls of ancient palaces. At dawn, the parade reaches the ancient fishermen neighbourhood and bands start playing again: the city wakes up, and the atmosphere is so endearing that it gets really hard to describe. Prayers, songs, vows, faith combined with one of the most ancient religious traditions in Europe: the Misteri procession of Trapani is an outstanding evidence of the most intimate and spiritual character of Sicily, and an unforgettable experience indeed for the guests of our villa rentals in Trapani!